The Wall Socket Safe installs in seconds and includes a locking key and cut-out saw with template. All of the installation hardware is included. 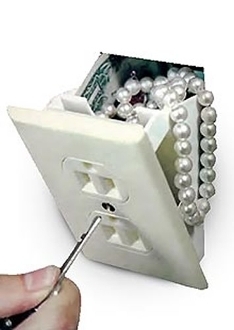 Looks just like regular working wall electrical outlet with one added advantage The secret pullout compartment is perfect for hiding your small, valuable assets. Made of high impact plastic and metal. Once installed it pivots out to reveal the secret hiding place. The internal compartment measures 2.25" Wide x 2" Tall x 5" Deep.